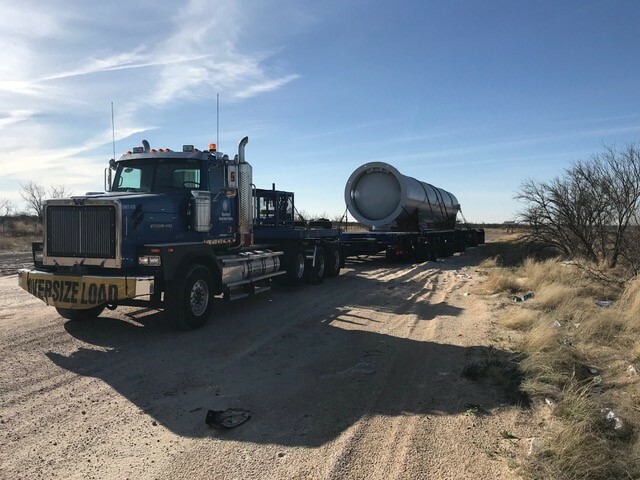 Hansa Meyer making hard turns easy from Texas to New Mexico. The Storage Tank is 162'0" in overall length, 16' wide and 18'4" tall with a total weight at 428,000 lbs. 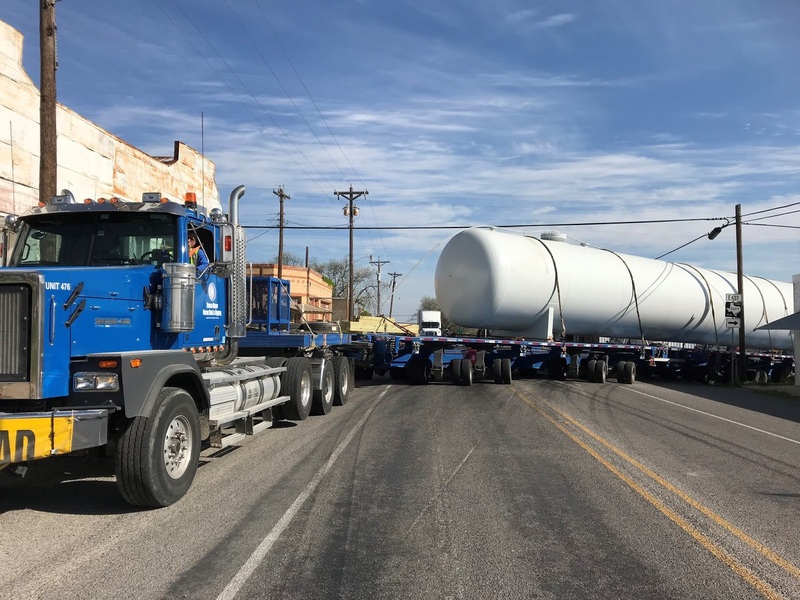 Hansa Meyer Heavy Haul & Rigging delivered a 310,000 lbs (gross weight 517,000 lbs) vessel from Texas to New Mexico. 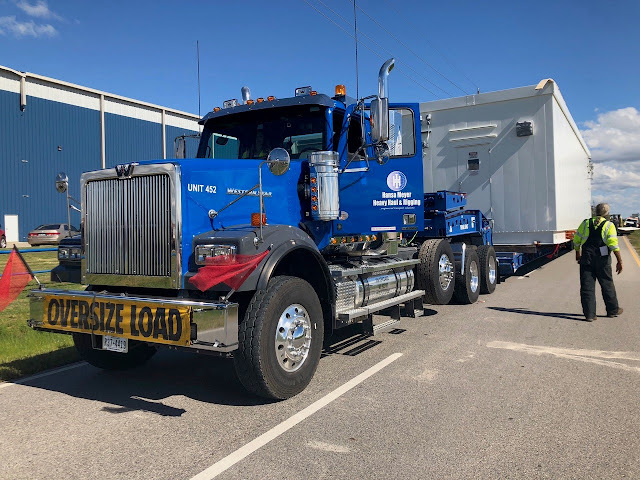 161' x 20' x 16'6"
Using Hansa Meyer Heavy Haul & Rigging's Prime Mover and 10 line Dual Lane Trailer with a 3 meter spacer deck. 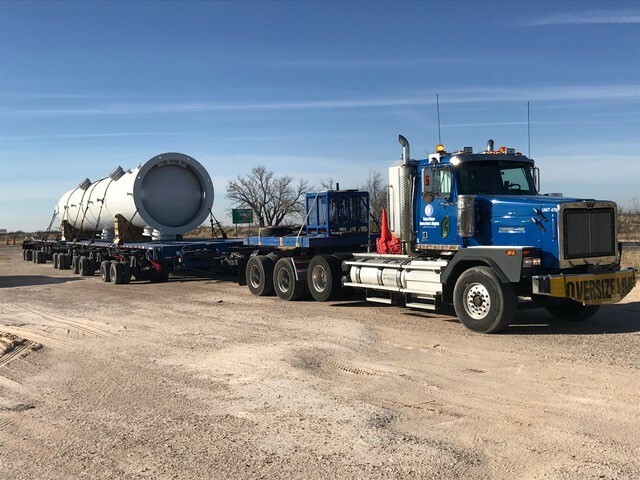 New Mexico had specific requirements that Hansa Meyer was able to accommodate. 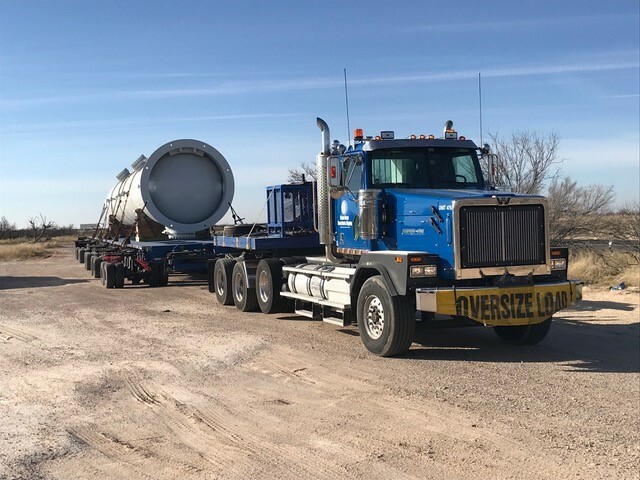 Hansa Meyer was contacted for the removal of a dryer drum under a structure. Frist we scanned the entire site with our Leica MS60, then placed stands, jacks and slide system as well as our SPMT’s to remove and re-install the drum. Everything was performed on time, with precision and without any damage. Hansa Meyer Heavy Haul & Rigging team configured our own Goldhofer 16 line THPSL trailer with (2) 9m spacer decks to accommodate the length and weight of the demethanizer. 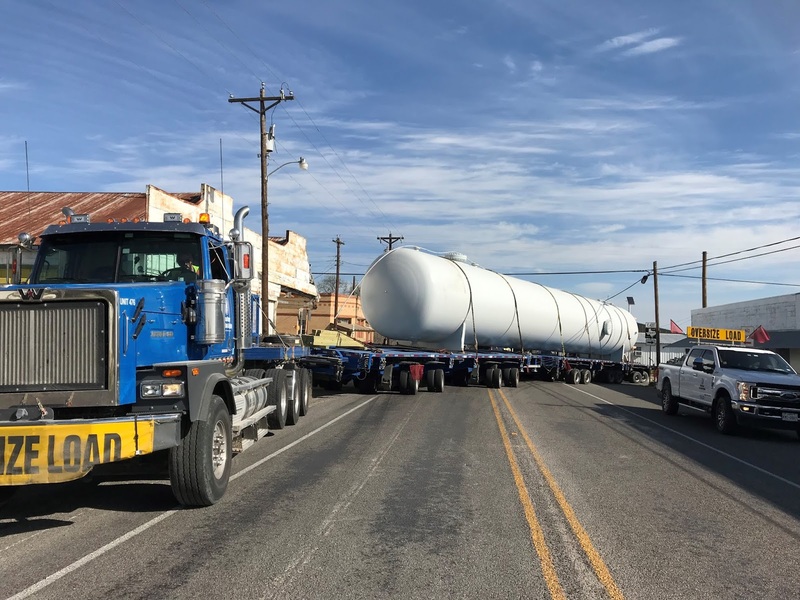 Our team worked close with TXDOT to ensure permits would meet the time frame of our customer with such short notice. 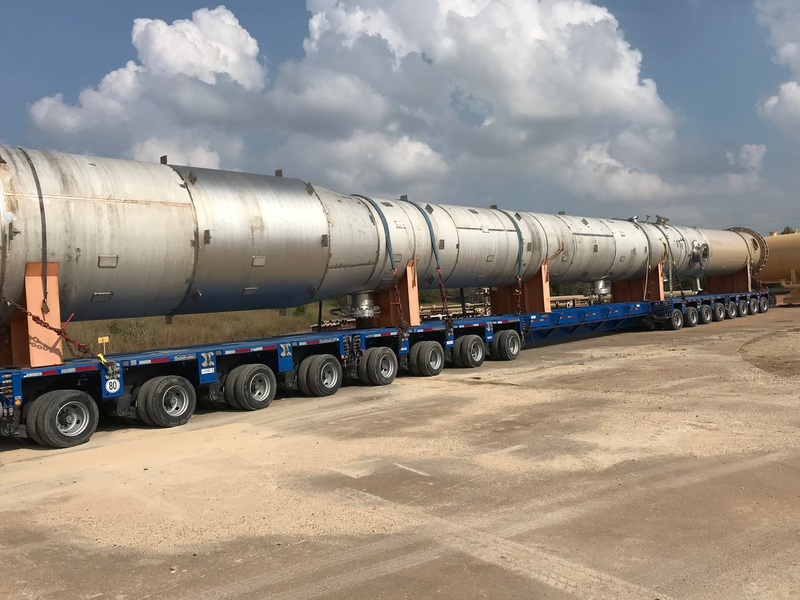 Hansa Meyer Heavy Haul & Rigging team maneuvered several tight turns in the Houston area without any issues. 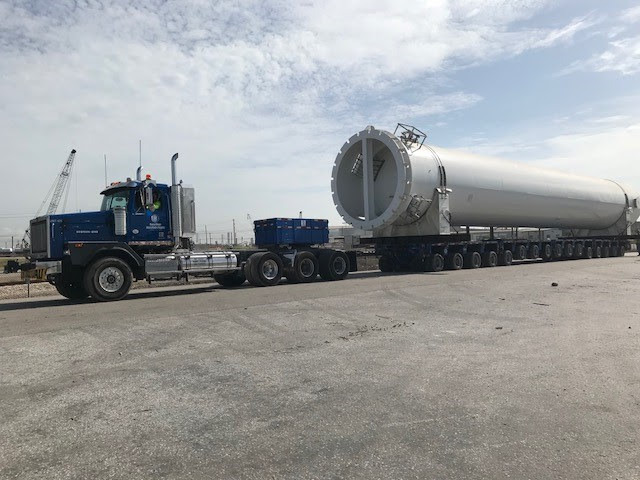 Hansa Meyer Heavy Haul & Rigging made it to final destination on time without harm to the public or infrastructure. A special thanks to the permit efforts of the great State of Texas to make this work. 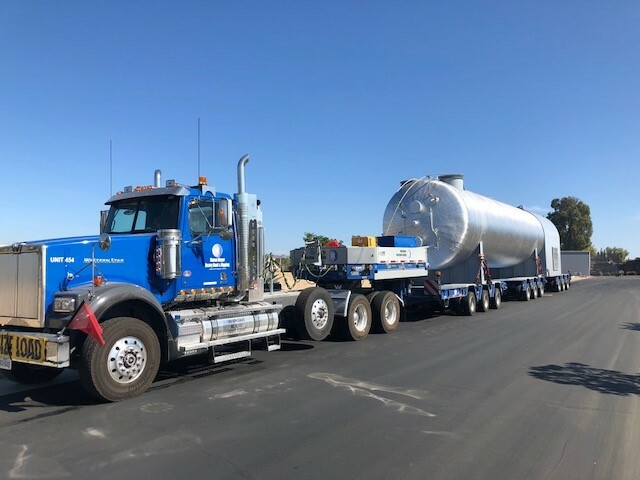 From the manufacturer in the Midwest via California to Central America handled by Hansa Meyer. 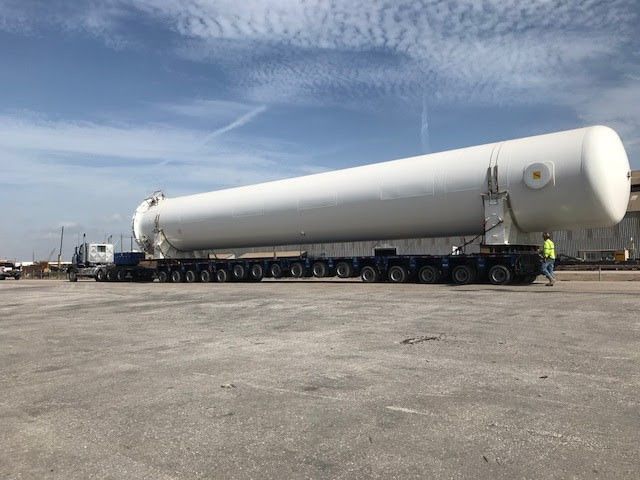 Hansa Meyer Heavy Haul & Rigging moved the tank with its STZ9 Goldhofer trailer to the port while Hansa Meyer Global arranged the ocean freight transport to Central America. From California to the Caribbean all with Hansa Meyer. 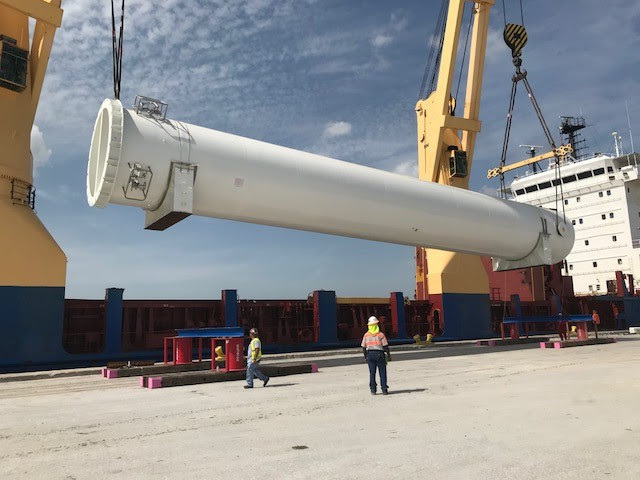 Pick up with our Goldhofer STZ9 in California and moved to the Port of Houston where the Hansa Meyer Global team organized the ocean freight transport to the Caribbean. 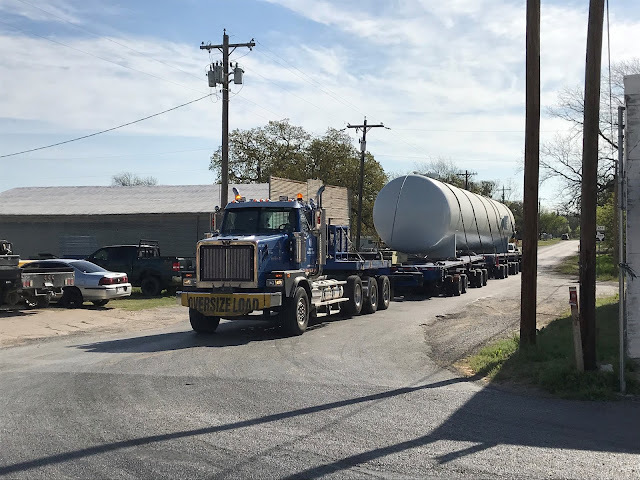 The Hansa Meyer Team is at it again this time for a Texas sized tank transport. 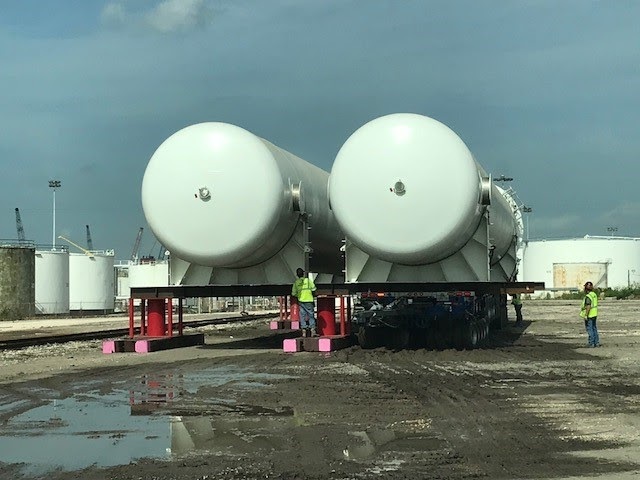 The (4) large tanks where under a very tight delivery schedule. The Hansa Meyer Heavy Haul Team worked closely with Hansa Meyer Global on discharging the tanks to Hansa Meyer Heavy Haul’s Goldhofer THP trailers in tandem during discharging vessel. Hansa Meyer Heavy Haul quickly worked with our Texas permit office in Austin, Texas and received the transport permits in record time. 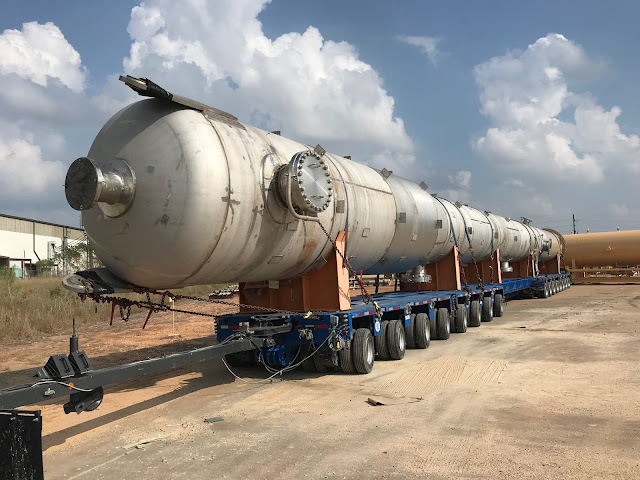 Hansa Meyer Heavy Haul delivered the 1st (2) tanks and quickly returned to the Port and self-loaded the last (2) tanks. Thanks to all of our Hansa Meyer team members in working together on a very aggressive schedule coming all the way from Turkey. 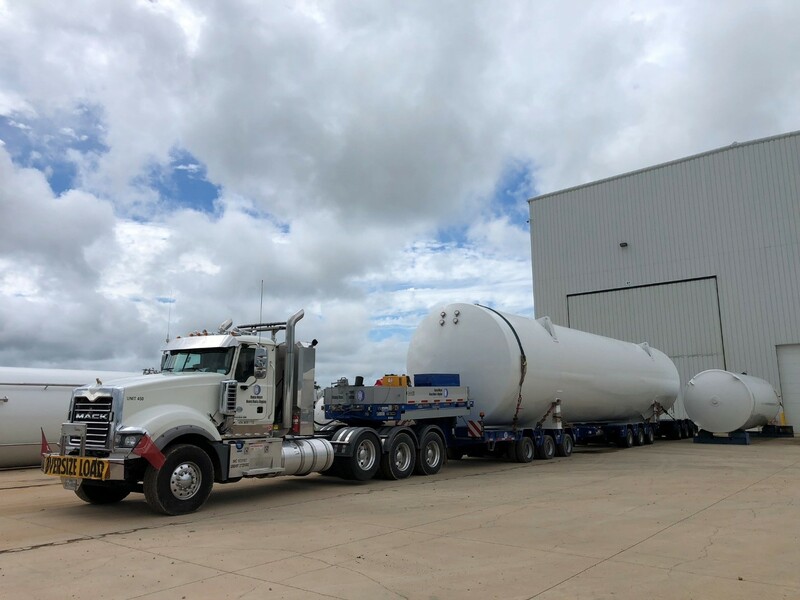 Check back in for an update on transport to the final destination. 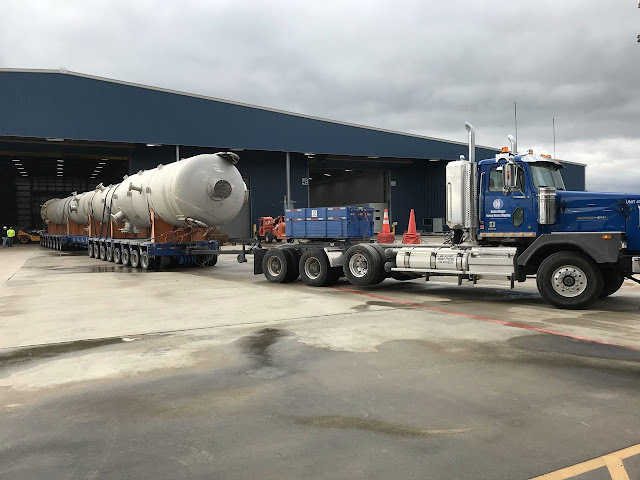 One of (4) tanks being offloaded and positioned on stands and beams. 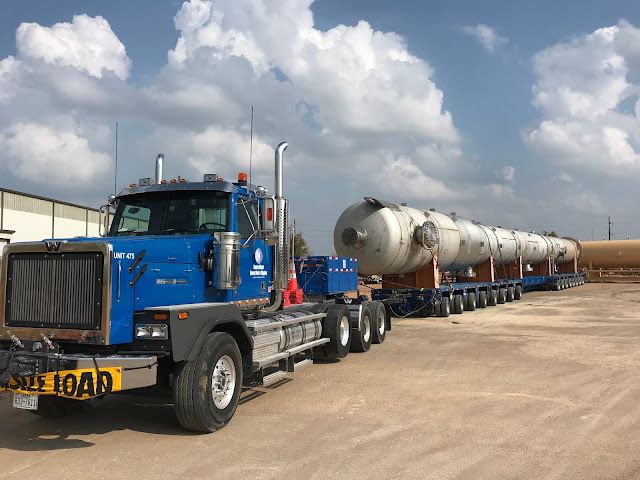 Tanks being transported on Hansa Meyer's Western Star and (16) lines of SL trailer with (6) lines of axle lifted for spacings for bridge department. 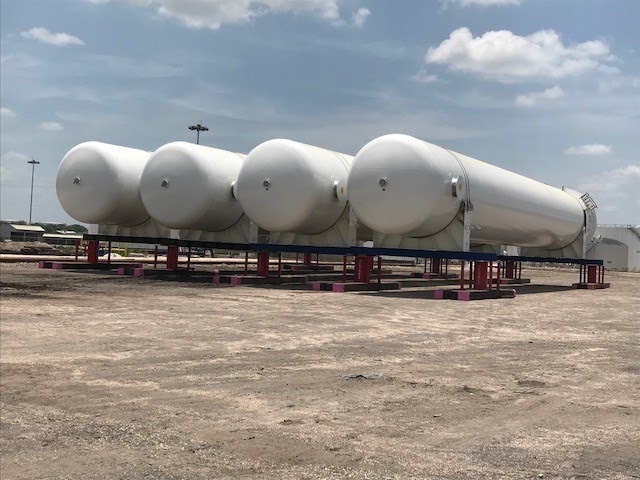 The tanks staged on stands and beams at the storage site awaiting final transport. Hansa Meyer Global Transport USA, LLC. Simple theme. Powered by Blogger.